The President of the Ghanaian German Economic Association (GGEA), Mr Stephen Antwi, has urged businesses in the country to uphold their integrity in order to attract foreign partners. Integrity, he said, was the enabler for credible foreign partners to build a long-term relationship with Ghanaian businesses with the aim of enhancing their capacities to penetrate the international market. 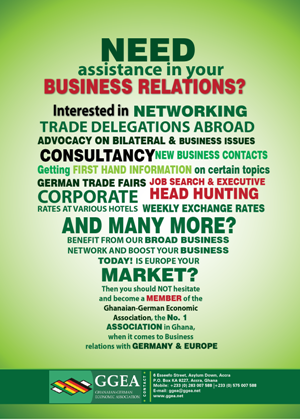 “It is important for us as business people to partner with credible foreign business organisations especially in Germany in order for us to realise our full potential,” Mr Antwi said in an interview with Graphic Business on the sidelines of a business forum organised by the GGEA in Accra. The forum was held on the theme ‘Doing Business with Germany’ and it brought participants from the private sector, policy makers and people from the government to deliberate on issues affecting businesses in the country. The forum also gave participants an opportunity to know more about the various opportunities German organisations offer to the Ghanaian private sector to enhance their capacity. About Ghanaian businesses partnering German organisations, Mr Antwi indicated that the ‘Made in Germany’ tag was synonymous with product reliability and quality. A lot of Germans present economic success which was based on engineering expertise and specialised technology. “Some of you (participants) may know that Chinese factories utilise heavy machinery from Germany to manufacture their consumer goods,” he stressed. He opined that reputable financial entities including the DEG were ready to offer the needed financing to assist qualified companies who meet specific requirements. According to him, the GGEA could introduce you to the right business partners and help you source for quality products and services from Germany. “Joining one of our multiple business delegations to Germany could secure a reliable and credible business partner and investor for your mutual benefits,” he identified. The Head of the Visa Section, Embassy of the Federal Republic of Germany, Mr Philipp Liesbrock, said the embassy offered different types of visa, which included the multiple year visa, U-blue and job seekers visa and visa for highly qualified personal to the public. He said the German government was committed to enhancing trade either through government-to-government level or empowering organisations in that country to partner with businesses in the other country. Germany has a lot to offer, not only the big names, but also the small and medium scale enterprises. Germany is doing well on the energy front, having installed renewable energy capacity which is able to contribute 25 per cent to their grid, and about 50 per cent in summer when sunlight is plentiful. This shows how much Germany can offer when it cooperates with Ghana on many fronts.